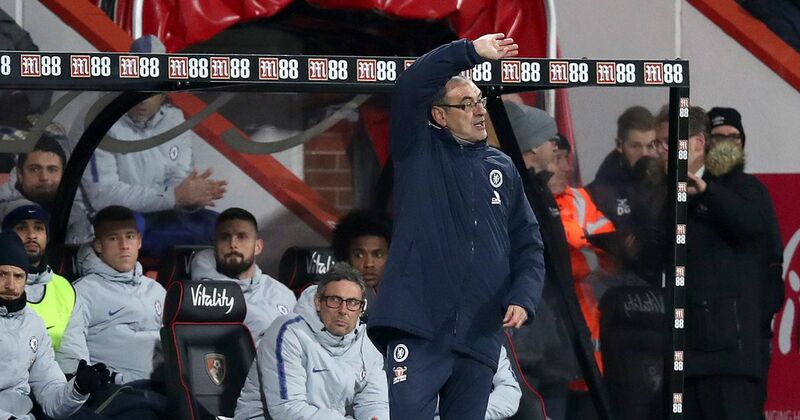 Chelsea boss Maurizio Sarri has questioned his ability to persuade Chelsea’s spluttering stars after their embarrassing 4-0 away loss to Bournemouth at Dean Court on Wednesday night. The stunning defeat positioned Chelsea to the biggest Premier League loss for over 22 years in the club history and was their fifth loss in the last 12 league games. The Blue’s have dropped out of the top four – with London rivals Arsenal ahead of them on goals margin – to leave their quest for Champions League spot under extreme threat. However, Chelsea manager Sarri, who freely scrutinized his side’s methodology after the recent 2-0 defeat at the Emirate, directed an extensive post-match inquest alone with his players subsequent of asking his backroom staff to leave the dressing room. The Blue’s boss is facing serious scrutiny on his tactics and unable to motivate the players just half-way through his first season. And the former Napoli boss admitted he is starting to get annoyed by Chelsea’s inconsistency. “I feel frustrated. Not under pressure. I didn’t see the signal of my work. So I am frustrated,” he said. “We had 43 minutes still to play, so we could solve the problem. But not with that kind of reaction. “At the moment, they are able to react very well always against a big team. When we play against a big team, usually we are able to play with a very good level of motivation. The withdrawal of Gonzalo Higuain in the 64th minute prompted chants of ‘you don’t know what you’re doing’ from the Chelsea supporters. Sarri said: “We have only to say sorry to our fans. We can lose, of course, in every match, but not in this way.